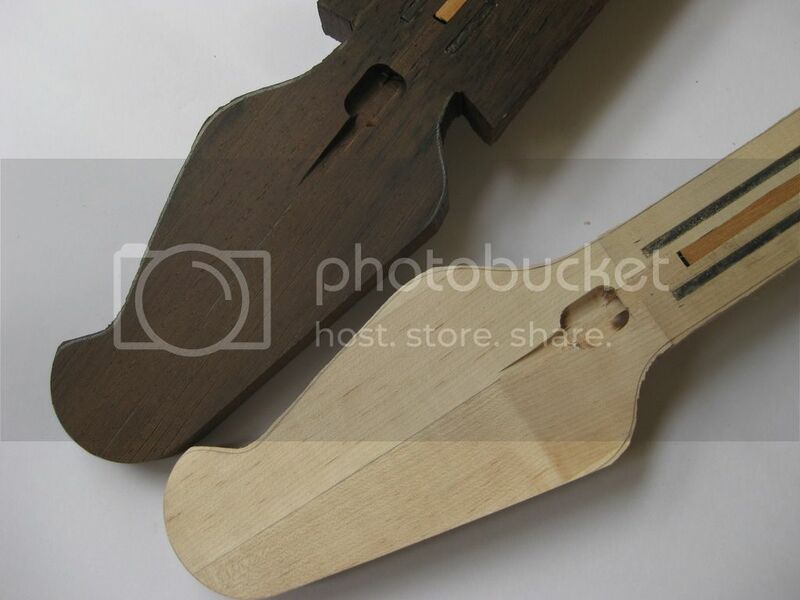 Some shots of the neck truss rod pocket, the truss rod in-fills and the graphite rod inserts. In this shot you can see the headstocks needing final sanding/shaping, the truss rod access route, the graphite rods (glued in with epoxy and scrapped level ready for the fretboards to be glued on. 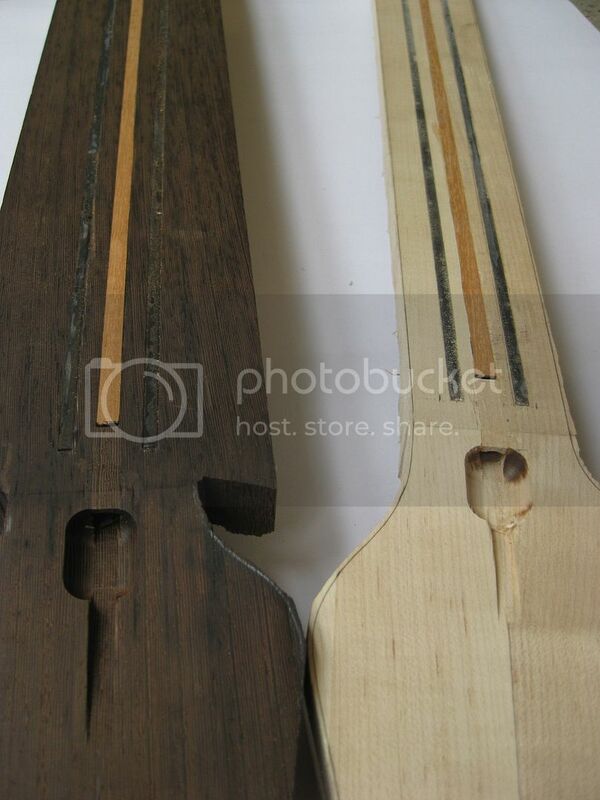 You can also see the small in-fill pieces over the truss rod nut and the longer in-fill strips of mahogany that sits above the two way truss rod (This compresses the truss rod into it's slot and prevents 'rod rattle'. I'm really looking forward to gluing these fretboards down. Last edited by David Searle Guitars on 14 Dec 2015, 11:06, edited 1 time in total. 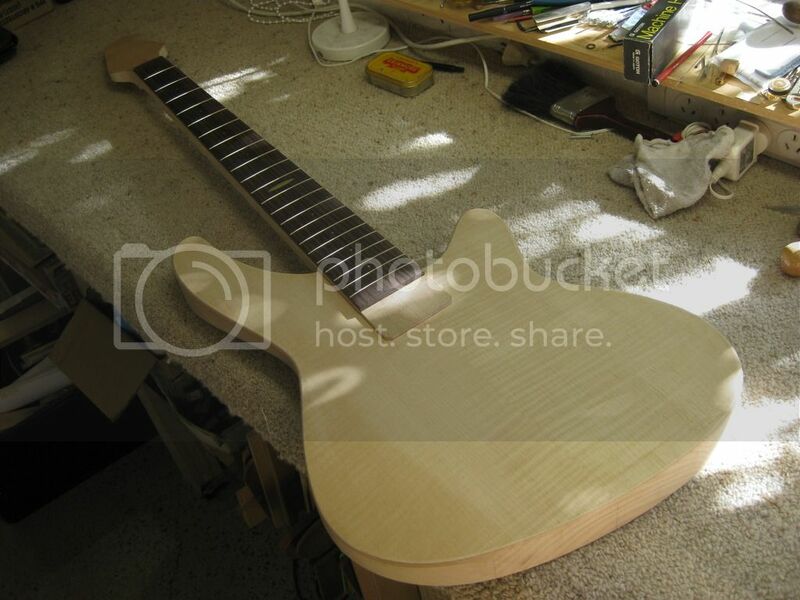 The necks and fretboards look terrific David. I have a feeling that these will all be quite amazing instruments. Fretboard done and fretwire in! The neck sitting in the body. 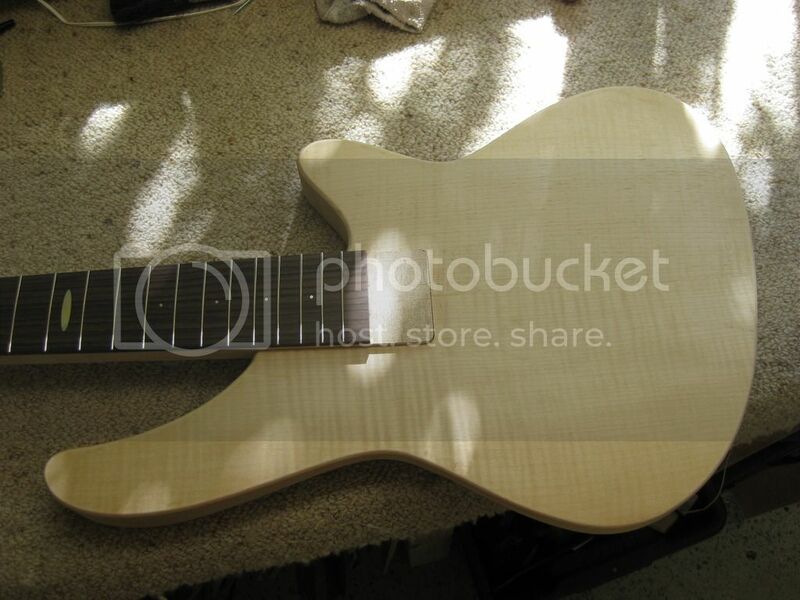 Next will come the shaping of the neck and the carving of the volute as well as the headstock drilling and refinement of the back of the headstock. The end of the neck will also be trimmed down, level to the surface of the body. Again, small frets as per Fodera and Dingwall. 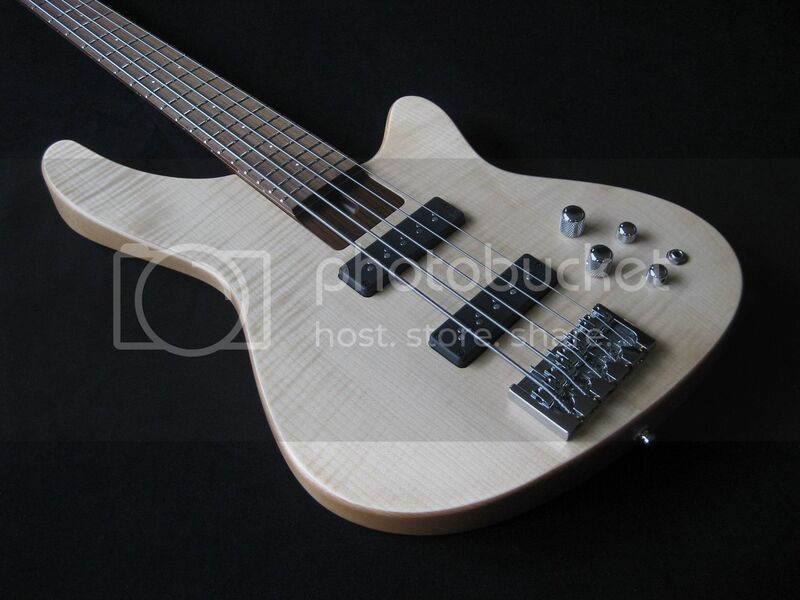 I've got some Nordstrand pickups coming soon, so some more routing of the body coming right up. This one is now finished to! 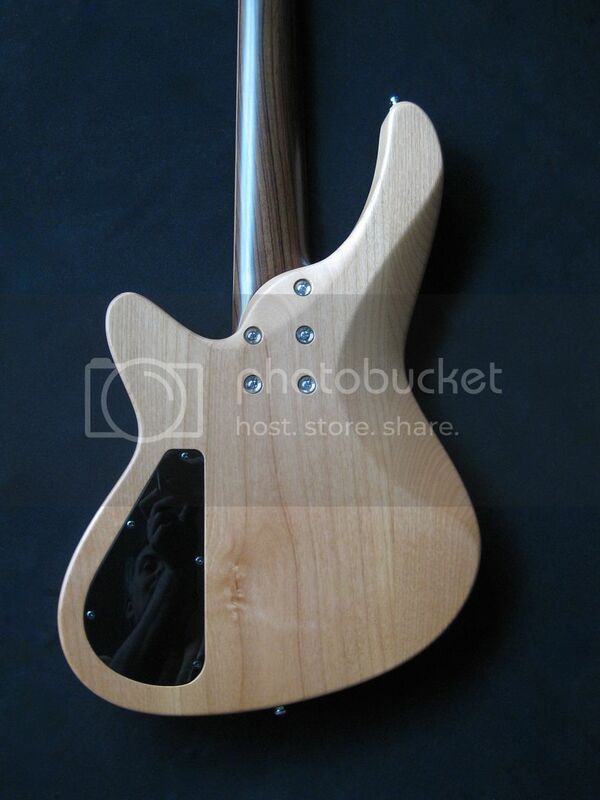 I had a change of mind late in the piece and have reserved the neck originally for this bass for another build. 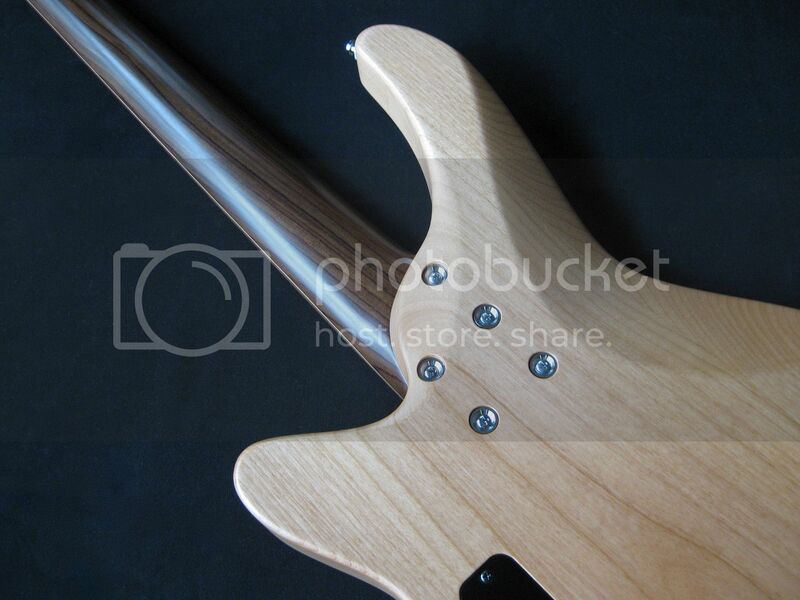 So instead I made another neck for this body in Rosewood. Yep! ALL rosewood (with a small bit of veneer pinstriping along it's length. I have painted it with satin nitro, originally thinking that I'd shoot a colour over the highly figured maple veneered alder body. 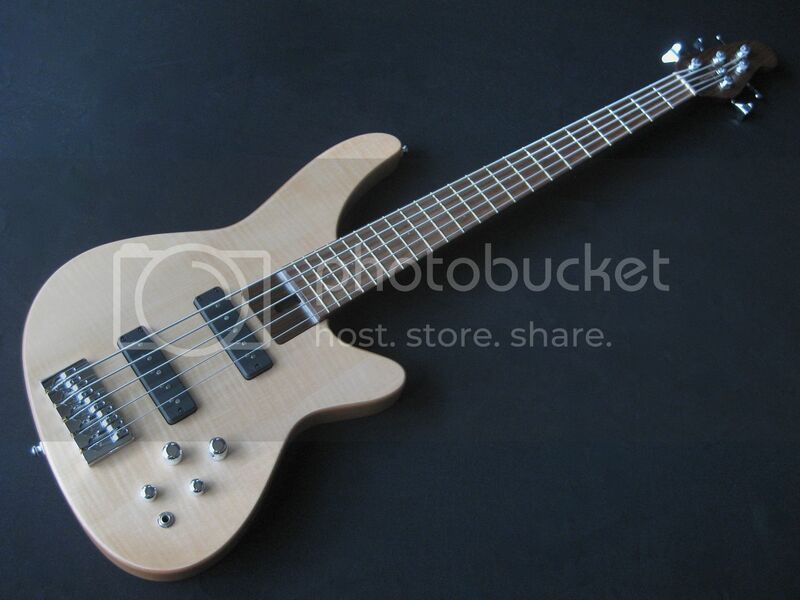 But it looked just so good natural with the rosewood neck I just had to leave it alone. Sometimes less is more. 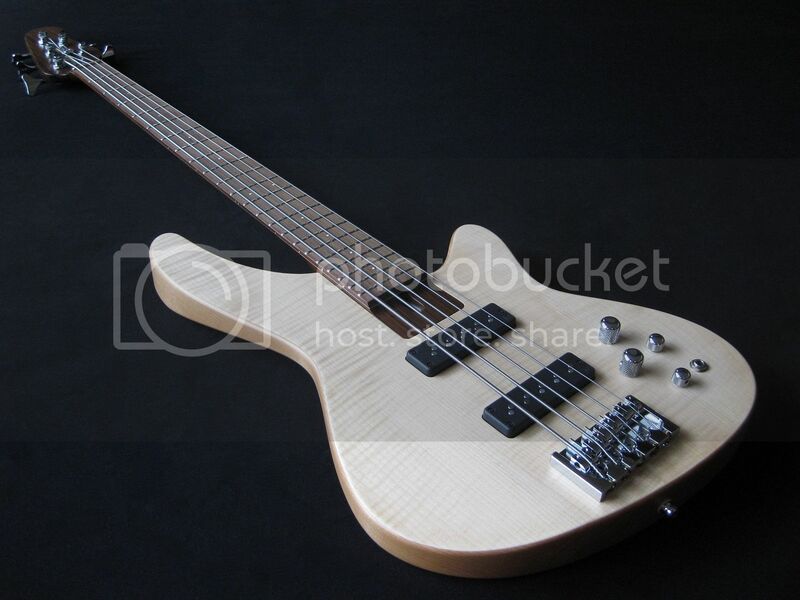 The scale of this bass is 35", with a Hipshot A style bridge, Nordstrand Big Singles and a Glockenklang 2 band preamp. 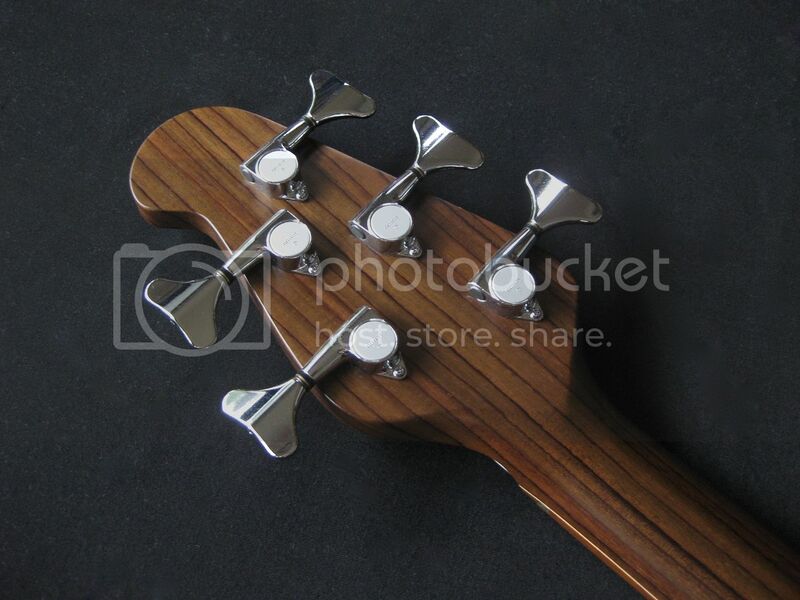 The headstock sports light weight Gotoh tuners and a brass nut. This bass sounds very big (Nordstrand aren't kidding when they call their single coil pickups 'big Singles') and the Glock can send it right over the top! 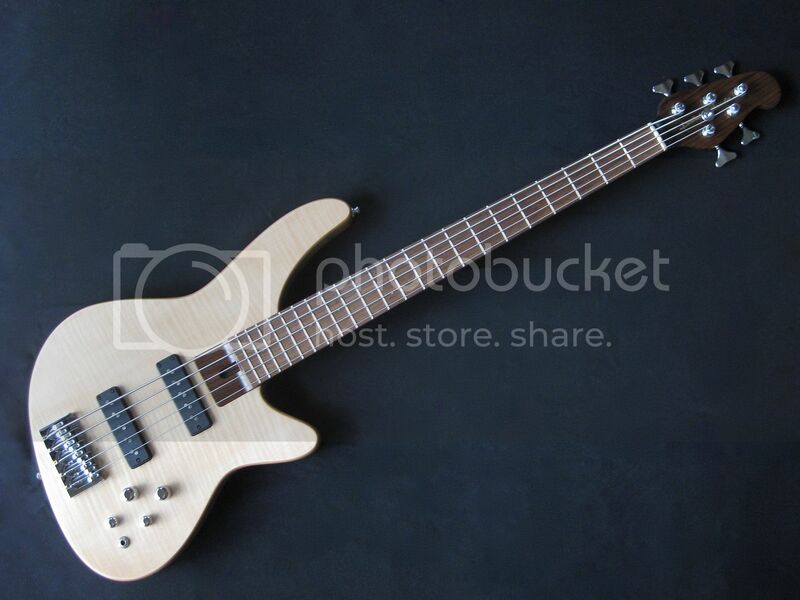 This bass will be at the Melbourne GTG this coming weekend. Last edited by David Searle Guitars on 14 Dec 2015, 11:07, edited 1 time in total. 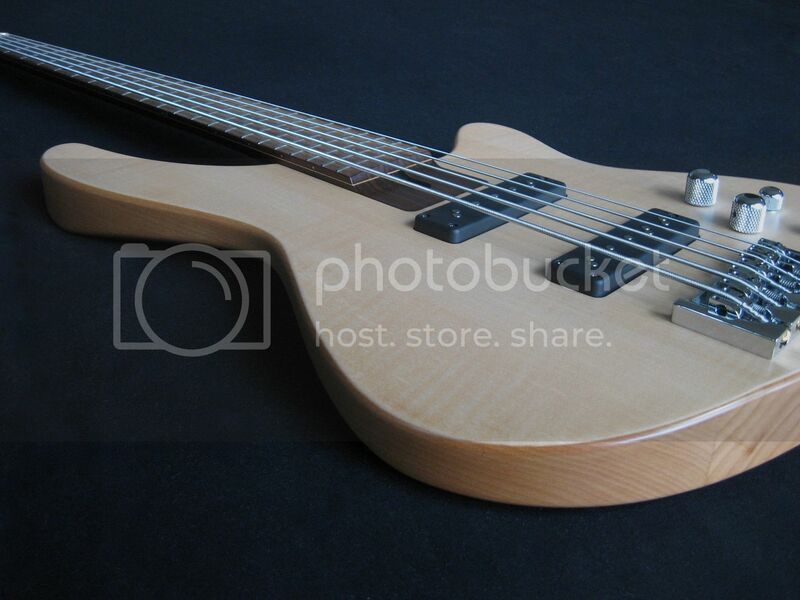 I just love the beautiful simplicity and elegance of this bass! Last edited by David Searle Guitars on 14 Dec 2015, 11:08, edited 1 time in total. Much more "traditional", David, and I like it. What really works here is the veneer - because you put it on after shaping the body it looks "whole". Beautiful. 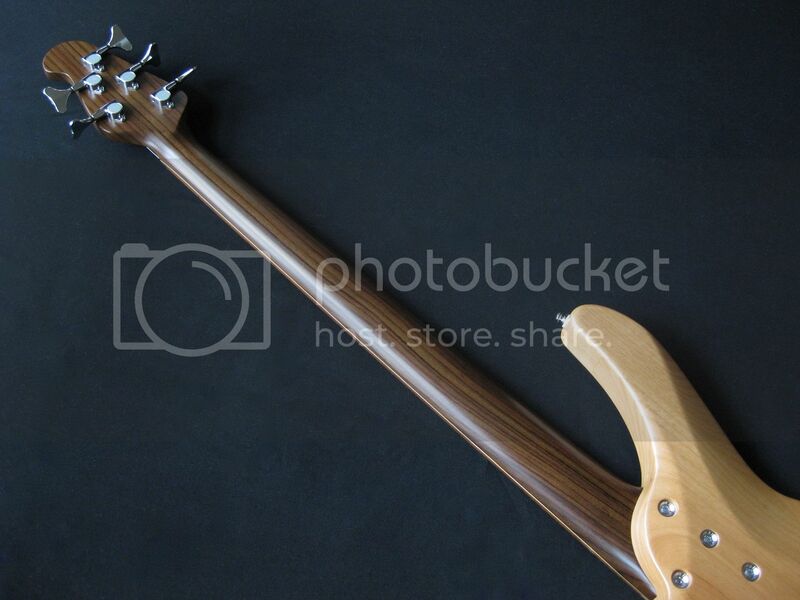 It looks so good, I'd be afraid to touch it... that neck is AMAZING!